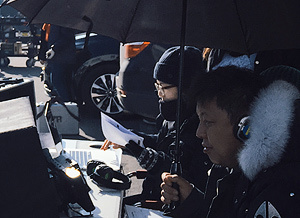 South Korean director Lim Young-Hoon's film The Soup is receiving critical acclaim as it tours the festival circuit. The director shared with AIFF some insight into his film. AIFF - If you had an extensive rehearsal process with the actors, what did you talk about, and what did your actors bring to the table that really surprised you and let you know they were perfect for the parts. Or did you know they would be great when you cast them? Young-Hoon - I don't think the handicapped people are all the same. That's why we had so many rehearsals before filming. Some actors were cast through the auditions before shooting, and the actors of the main characters were cast through the images of former works. So what we found out during the filming was that the actress So-Yeon Jang (the child's mother character) actually has a mother who has disabilities and it was very surprising. We thought that it'll be best when it comes to expressing the pain. And also the starring actors and the movie team visited community facilities to meet actual people with disabilities and spent lots of time to help and listen to their own stories. AIFF - The characters in the film were treated viciously by seemingly everyone they encountered on the street. Is this something that is common and you wanted to shed light on? Young-Hoon - I believe that people are all alike whether they have or don't have disabilities. But people who think they are normal at some point think that there are a lot of disabled people and some are socially surplus. I wanted to show how hurtful it is because of some regardless and thoughtless actions of people and it can be seen through the movie. AIFF - Did you ever consider some cutting some of the scenes with the child actor that were disturbing or that's the reality, it must be part of the film? Young-Hoon - This movie is based on a true story. I am a person who believes there is no absolute evil, and everyone just needs attention and love. But some people grow up without basic needs and have bad customs and habits. That shows why Jae-gu goes back to his bad habits and makes mistakes while he hopes to be a part of Sun-yeong's family at one point. I don't think that the basic needs like love, attention and education has anything to do with fortune. People might think that disabled family could be unhappy or even depressed, but that's not true. They feel grateful and happy for smaller things. The parents affection for their children are the same whether disabled or not, and that was why we had so much considerations about the scene which Jae-gu sexually assaulted Sun-yeong. But I thought it is necessary to picture the true story. AIFF - How did the locations affect your style of shooting? Young-Hoon - I mostly liked the location of the filming site, and I think we have done our best when considering the cost and environment we had. AIFF - Have you experienced any negative feedback from home about how you showed the disability of the characters? Young-Hoon - There weren't much negativity. Rather, we were told that the characters' gestures and actions were more realistic and interesting than conventional films.